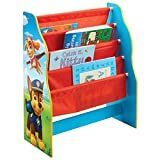 Children’s sling bookcases can be found everywhere as there are good varieties available online as well as at different stores. You may, however, want to pick quality ones that would be ideal for your children. 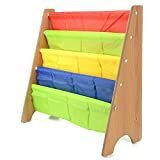 Below you can find top 10 bestselling sling bookcases for kids of different age groups. Dimension(LxWxH): 62cm x 26.5cm x 61cm/24.4" x 10.43 x 24". 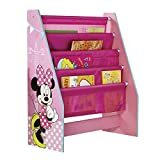 With bright coloured nylon fabric pockets it attracts kids and makes them interested in reading and learning. 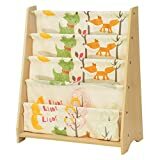 Reduce clutter of kids room and help them develop good habits at early age. Easy to assemble, provide screws and instructions, just take few minutes for fully assemble. 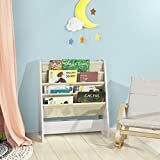 Freestanding children kids bookcase - 4 handy storage partitions - ideal for holding books, magazines, etc. Suitable for children ages 3 and up, promotes organisation and reading skills. 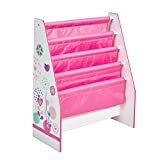 The sturdy particle board frame is connected with 5 strong steel rods which hold the durable polyester fabric pockets. Dimensions: W62 x D29 x H71cm. Weight: 5kg. Load capacity: 25kg.